Welcome to Market Profile Series. In the last tutorial we seen Excess High and Excess Low. In this tutorial we will be seeing couple of examples on Halfback Reference. 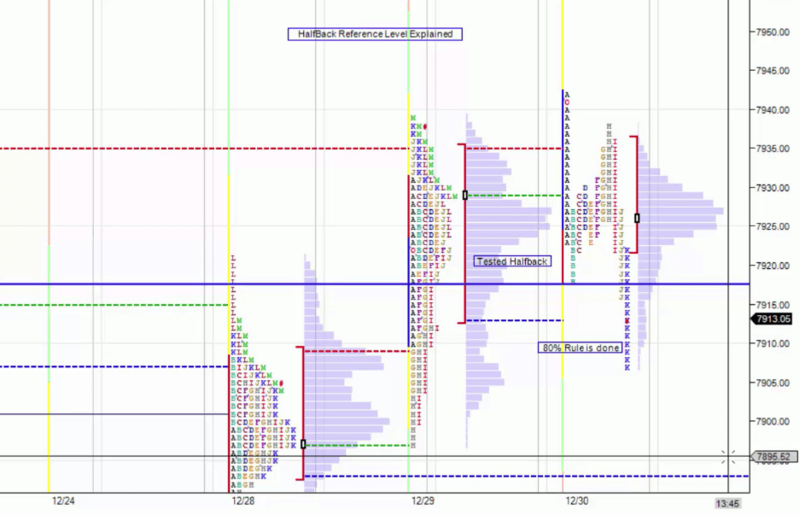 Halfback generally refers mid point of the previous days profile (prev days (H+L)/2). Halfback is a Weaker intraday reference or shorter timeframe reference where the weak day timeframe or shorter term timeframe traders are entering at that point mechanically at that reference level exactly or 1-tpo above/below halfback reference level. Longer timeframe or positional traders have no idea about that reference level. More likely Day timeframe traders or very short term traders are likely to initiate trades at that zone and more likely their stops are very close to that halfback reference. If the price is testing the halfback reference zone during the initial auction phase (first one hour) and bouncing back exactly from the halfback reference or just 1-tick below or above the halfback reference level then more likely the day timeframe players are initiating their traders at halfback and more likely they are going to stopped out during the later part of the session. 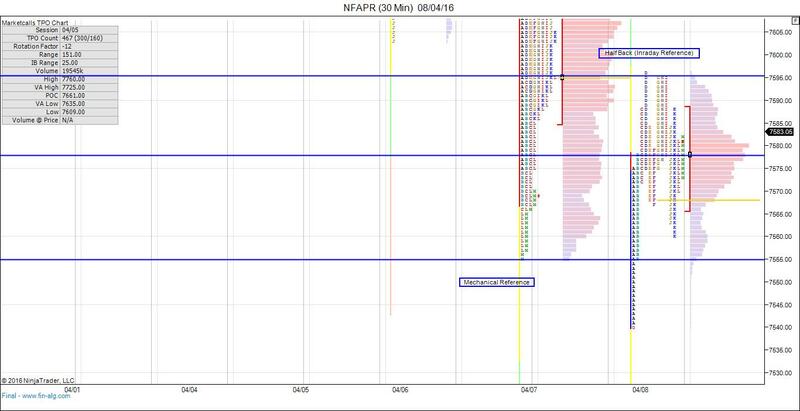 In the above profile you can see that at ‘B’ period market came down to test the halfback reference (mid point of prev days profile) and bounced back and hence it is a weaker reference which has high odds of coming and test that reference level intraday. Price came down back again at J&K Period just to remove the weaker hands stoploss. If the Price is testing the halfback reference zone post the initial auction phase and bouncing exactly from the halfback reference level either a day timeframe or shorter timeframe is likely to be in control. More likely they are weaker players. In the above profile you can see that at “D” period tested the halfback reference just 1-tpo above halfback and reacted mechanically. Later price tested the halfback reference level thrice exactly at the letters G,H,I which indicates more and more shorter timeframe sellers are initiating positions mechanically at the weaker reference level and which again indicates high odds of revisiting to remove their stop loss. In the next tutorial we will be discussing more in-depth about POC and Value Area Concepts.